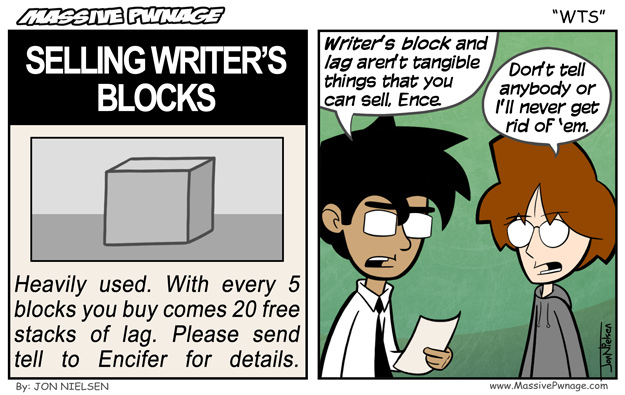 I got the idea to make writer’s block an actual block from an awesome fan comic a member of the forums made. I never thought of it that way. This entry was posted on Monday, February 2nd, 2009 at 12:00 am and is filed under Comics. You can follow any responses to this entry through the RSS 2.0 feed. Both comments and pings are currently closed. Actually, there are anti-lag scripts, so maybe u can make lag scripts and sell the lag! That will be 10 bucks please. Actually, I really did have a Writer’s Block. It had a different excuse on each side. I would change it every other day or so.